Better Angels Now » Anthem Extraordinaire: "Brothers in Arms"
Mark Knopfler and Dire Straits helped steer my love of good music through the stinky stuff that was Disco in the late 1970's, and for that I will always be thankful. Not only could these guy rock, but they were exceedingly adept at crafting inextinguishable ballads, such as "Romeo and Juliet", but also the ballad/anthem hybrid, such as the classic "Brothers in Arms". 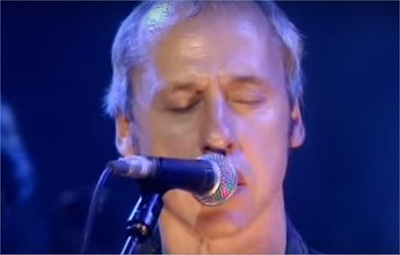 "Brothers and Arms" was mostly written by creative genius and front man for Dire Straits, Mark Knopfler, about the short and decisive Falklands War between Great Britain and Argentina in 1982. The song's phrasing of verse, embodying the sense of duty of the good warriors that protect we, ordinary people, infused with Mark Knopfler's mournful guitar rendering at key turns in this anthem is the mix that created this classic that artfully well sums up the brotherhood of battle for those that have been called to sacrifice for a society free from tyranny. Mark Knopler singing "Brothers in Arms" from A Night in London -video capture. The ballad/anthem "Brothers in Arms" is the titular song for the album Brothers in Arms, released in 1985, to huge critical acclaim. The album is thought to be by some critics, the last great album of the band with On Every Street, released in 1991 after a long studio hiatus for the band, not measuring up to their former successes. I purchased this collection of songs, as I did purchase all of Dire Straits other Albums; and although critics hated it, On Every Street was a decided turn for Mark Knopfler, which continues now - his creating music that suggests a varied influence by music endemic of other nationalities. On Every Street well represented American music - a more traditional take on Rock 'n' Roll, with tinge of blues and country. But enough critique blather; back to what we are here for - the one great anthem "Brothers in Arms". Below, we offer five six live video versions of the song, beginning with a live rendition performed in Australia, by Dire Straits in 1986, when they were promoting the Album by the same title. The aforementioned Australia version: Below. This second rendering of the melody form Knopfler's solo performance of A Night in London, which was performed in 1996. I offer these many versions of this classic due to Knopfler's knack of always performing at his utmost in quality, but differently each time: Below. Eleven years later, we have this edition of "Brothers in Arms" performed by Mark Knopfler in Berlin, and this version does not suffer: Below. This next version is at the AVO Sessions in 2007, performed in Basel, Switzerland. Speaking for my novice self, Mark Knopler is the guitar player's guitar player: Below. This version was live in Nimes, France in 1992, when the band toured to promote On Every Street, their last album of songs. You may notice that there is much clapping reminiscent of the standard encore ceremony for a major act, like Dire Straits. For the most part, after the release of "Brothers in Arms" in 1985, the band usually closed with this encore piece; a tradition mostly carried forward by Mark Knopfler in his continuous solo act: Below. The last bonus version of "Brothers in Arms" was performed in 1988 in South Africa at the birthday for Nelson Mandela. If the song sound markedly different, the guitar rifting, look for Eric Clapton standing on the stage with fellow Brit Knopfler: Below.